With the support of His Highness Sheikh Mohammed Bin Rashid Al Maktoum, Vice-President and Prime Minister of the UAE and Ruler of Dubai, the International Humanitarian City facilitated an airlift of much-needed relief items from UAE to Indonesia, Indonesia yesterday evening. 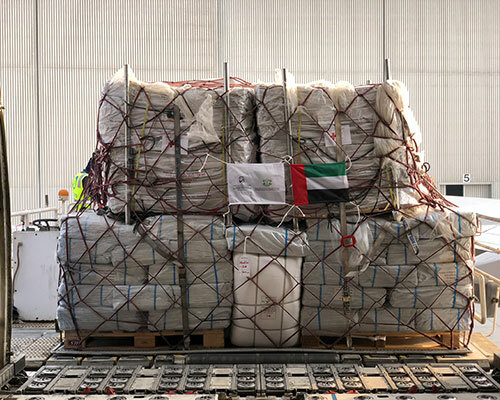 The aircraft transported some 91 metric tons of shelter toolkits, tarpaulins, and blankets provided by the International Federation of Red Cross and Red Crescent Societies from its stocks at IHC in Dubai. The airlift comes in response to the devastating 7-magnitude earthquake which hit large parts of the island of Lombok in August with a series of aftershocks in September. The deadly natural disaster has claimed the lives of at least 550 people, left nearly 400,000 people displaced, and caused damage and destruction to over 80 000 homes.